He is one of the most haunting characters in all of literature. At last the evolution of his evil is revealed. While the movie made Lambs the "favorite" in this series, this is the best story. Harris at his best as a story teller is right here. He is also a good narrator. GREAT listen. The story moves along slower than most thrillers (as some reviewers have commented), but I thought that this attribute was instrumental in setting the mood of the story. It was interesting learning about Hannibal's background and what made him do the things he does. I thought it was a very good story. 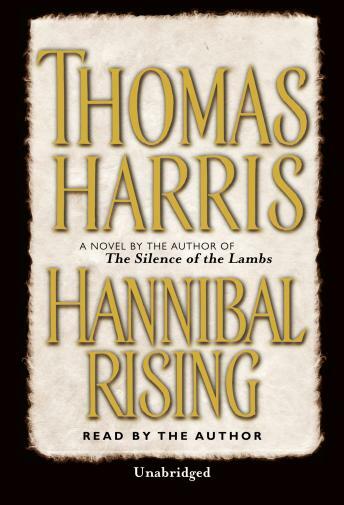 I normally like Thomas Harris' books, but... This audiobook is narrated by the author and unfortunately, he sounds so much like George Bush it completely ruined it for me. I sent it back after the first disc. Well I always did wonder why Dr. Hannibal Lecter ate people and how he came to be so cultured and knowledgeable. Now I know. If you don't share the same curiousity or if you aren't familiar with the Lecter character, then I would advise you to not bother. In this book we learn how Hannibal Lechter went from being the privileged son of Lithuanian aristocracy to the genesis of a serial killer. The amazing part is that Thomas Harris creates a background so traumatic that you find yourself thinking, "Well no wonder he went on to become a cannibal." As with all of Harris' novels it is well written with a beautiful use of language. The research done is evident for Harris takes us to a very believable late WW2 Eastern front setting as well as post war Paris. I found this audiobook to be an appetizing treat. I liked silence of the lambs, this was so slow though. I only got through the first CD and then returned it. First time i've ever done that with an audiobook. WOW! Although the "action" seems to be, at times, a bit slow, every detail is necessary to understand how modern literature's favorite "monster" came to be. I found this book completely enveloping - the kind you have to bring into the house to continue listening to long after the car's been turned off. The author's narration, unlike some others, does NOT take away from the pleasure of the book. As I listened, I could not help but empathize with all the children who have undergone the horrors of wars throughout the ages. It's a wonder there aren't more Hannibals in the world. You'll be totally entertained.